atouvap.fr • Consulter le sujet - LES BONS PLANS de HEAVENGIFTS en JANVIER ! Introduce you a new member of Wotofo Serpent family - the Serpent Alto, which is a single coil RTA tank, specially designed for flavor chasers. It remains the same 22mm diameter with Serpent mini, but presents in a higher height, with a cooling fin system on the top cap to reduce the temperature of the atomizer during vaping. The two post style build deck has been greatly improved with the air hole redirect to coil design, which means you will get a smooth and nice flavor. 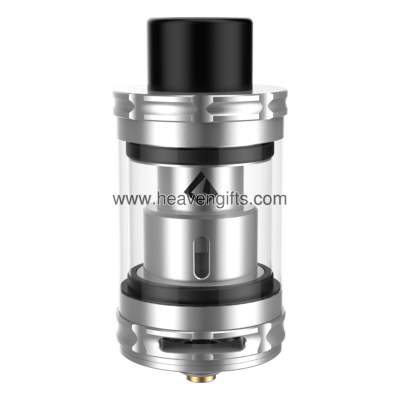 The tank body is made of 304 ss and Pyrex glass, with a campacity of 2.5ml in e-liquid. Plus a delrin drip tip, you can enjoy a warm vaping. Simply put, this WOTOFO Serpent Alto RTA is a flavor style atomizer for single coil builders. Use our Christmas special code "XMAS30" for a huge 30% off discount. Only 5 days left. Hurry up!!! Vaporesso didn't stop surprsing us just at the end of 2016, with its new release - Aurora, which is an all-in-one style vape device with innovative zippo shape design. It's no doubt a real pocket device for such a compact size. Operation is as easy as using a zippo lighter, just simply flip open the top lid and take a draw, no buttons needed. Featuring a built-in 650mAh battery and 1.2ml tank, this Aurora kit by Vaporesso is more targeting to new vapers or those who wanna a backup device. The tank adopts easy top filling system with leak-free design, double child lock and advanced ccell coil for optimal taste and flavour from your e-juice. The hidden drip tip design is also a plus, keeping your drip tip clean at any time. Don't forget to use our 10% off coupon code "AHG10" for an extra discount. Great news vape fellow! A real thin fin vape pod is just released, which is named as Sourin Air. Look at its size, 88mm height, 45mm length, 8mm width, a real wallet sized level kit!! And it is first manufactured by the Foxconn which is known for its iPhone manufacture. 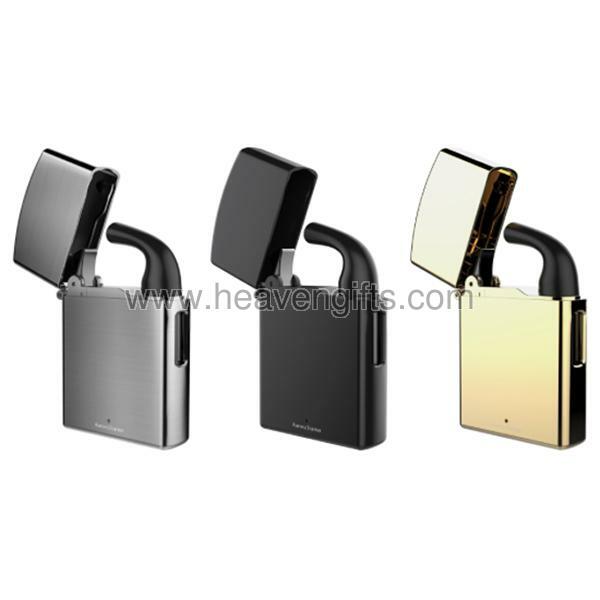 Suorin Air features a 2ml e-liquid capacity, no doubt it is a TPD ready product. Though it is a wallet sized kit, the battery capacity reaches as high as 400mAh, can be fully charged in 30 minutes! What's more, it has airflow control. The design is superior delicate. This is a kit really for vape newbie and stealth vaping! Use our Christmas special code "XMAS30" for a huge 30% off discount. Only 5 days left. Hurry up!! Introduce you the latest vape pen by Joyetech-Unimax 22 and Unimax 25. It is undeniable that more and more people need a compact and portable e-cigarette for their out&about. Other than this, it is expected to be customisable to show the owners identity and taste. Well, Joyetech Unimax is such a series features trendy and portable. It has many stickers for your options. You could chang the color of it to match with your dress every day. The Unimax come in 2 diameters-22mm and 25mm, for different vaping choice. Apparently,the 25mm has a relatively bigger capacity of e-iquid and battery-5ml and 300mAh. Both of them feature top filling, top airflow, comes with its BFL coils, which is leakage-proof for sure.The new BFL coils are proved to be the guarantee of the flavor quality cause its new and unique structure. If you happen to look for a vape pen and a flavor chaser, Joyetech Unimax is the one worth of your trying. Use "AHG10" to enjoy an extra 10% off discount. Introduce you a new kit from Joyetech, called eVic Primo with Unimax 25, which is a nice combo of a high powered box mod and the Unimax 25 tank. 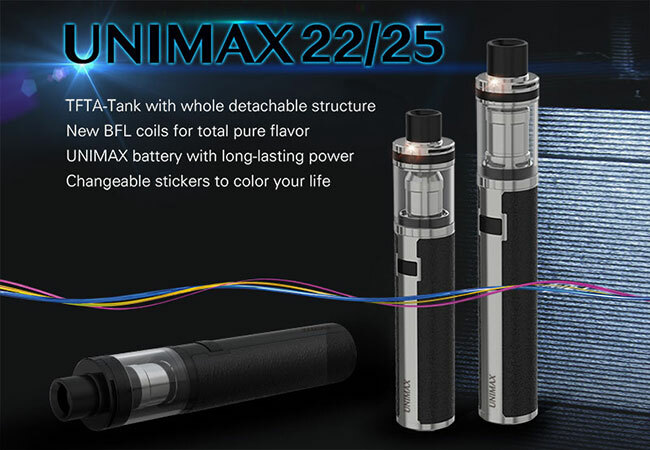 With the decent 5ml e-liquid capacity, the Unimax 25 tank features the exclusive TFTA system, massive adjustable airflow control and top fill system. The included BFXL coil can ensure you the total pure flavor due to its unique structure. Powered by two replaceable 18650 batteries, the eVic Primo puts out up to 200 watts, providing very durable and reliable vaping experience. It adopts the new equalizing charge system, which supports 1.5A quick charge capability, making you no worry at any occasions. It also comes with upgradeable firmware, large OLED as well as some trendy features like real-time clock, custom logo and preheat. Moreover, eVic Primo must impress you much with its innovative and convenient reverse charging adapter. If necessary, you can use it to charge your electronic products. So, how can you miss this multifunctional kit? Don't forget to use "AHG10" to get an extra 10% off discount. Dernière édition par heaven gifts le 18 Jan 2017, 06:06, édité 1 fois. 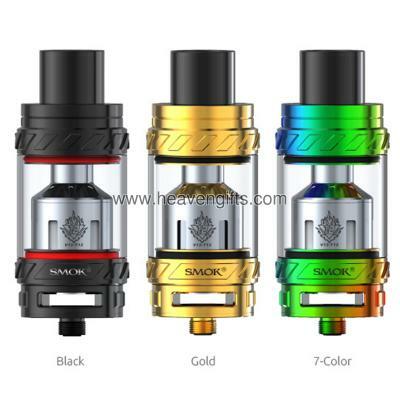 Speaking of Smok, their TFV line of tanks are definitely worth to mention. From TFV4 to TFV8, as a tank series mainly focused on cloud chasing, they really made a hit in the market. Now Smok extend this series with a new addition, TFV12. Just as the name implies, this new tank features a pre-installed twelve coil, V12-T12, which is no doubt the biggest and powerful coil head to date. And the TFV12 also comes with two quadruple coil heads, V12-X4 & V12-Q4, which all work perfectly with high power mods and improve the efficiency of e-liquid vaporization. For those who prefer building their own coils, Smok also provide an optional RBA edition for you, which includes V12-RBA & V12-RBA-T, both capable of single coil build when using a silicoone pad. The architectural structure of the TFV12 has been improved, with tank diameter upgrading to 27mm and the dual airslots increasing 30% in airflow area for better cooling properties. Top rotary refill design makes filling as easy as it gets. Leak proof e-liquid slot can significantly solve leaking problem. All in all, this Smok TFV12 must be the cloud beast king in 2017. Introduce you the new Geekvape RTA, illusion mini tank. Geekvape illusion mini is a sub tank that produces an outstanding vapor production and smooth & tasteful flavor. The Geekvape well made illusion coils use the optimized heating coil and the highest grade organic cotton to deliver you all new vaping experience! And it is compatible with most popular coils heads on the market! It includes 3 coils that meets most of your needs, a quad coil produces large vapor, a regular single coil gives better taste, while a RBA base is ready for DIY users. This is a new choice for your 2017 tank collection. Don't forget to use our coupon code "AHG10" to get an extra 10% off discount! Can you recognize your mod among many of them? If so, it must feature an unique look! Well, today Arctic Dolphin bring you an unique mod made of Stablized Wood, 80W Arthur Mod, which is affordable yet powerful. 1. Aesthetic. Arthur Mod is made of stablized wood. Some of you who are into modding might know there is no 2 stablized wood are alike,which means any of an Arthur mod is unique one. The whole look of it is designed by experienced American team, definitely worth you to grab it as one of your mod collection. 2. Powerful TC Function. A 80W power output may not that powerful if you only consider the figure. However, except regular Ti/Ni/SS temperature control modes, it also features TCR mode which enables you to adjust the TCR data to rock various kinds of wires. The most important, the mighty chip of Arthur supports CVU (Center Vaping Unit Technology)coil. 3. Voltage Boost Technology. Though it is a compact sized one and features a single 18650 battery, the voltage output is quite strong, as high as 9v! This Voltage Boost Technology gives Arthur a very wide TC resistance support range, 0.06~1ohm. Even in regular power mode, it supports 0.1~2.5ohm coil. It is doomed to be a big toy for vape veteran. 4. Brand New Operation Interface. Some of vape newbie may concern about its interface. Is it easy to play with? Well, the whole operation is divide to 2 catalog. 10 minutes is enough for you to get know it! Guys, for such a delicated mod, how much do you think worth it? Leave a comment with your preferred price below. By the way, just heard it through grapevine, a good deal of Arctic Dolphin Arthur will be started for this mod soon. Try google it! Re: LES BONS PLANS de HEAVENGIFTS en JANVIER !